Get a broader view of the world. With a fast wide-angle lens like the AF-S NIKKOR 24mm f/1.8G ED, you can create and capture exciting new types of photos and videos. Viewers are drawn into the dramatic wide perspective of landscapes, skyscrapers and interiors. Food, flowers, vehicles, jewelry, instruments and more jump off the frame against softly blurred backgrounds or foregrounds. Environmental portraits take on a dramatic new feeling with exaggerated depth of field. Whether you're shooting a DX or FX format DSLR, for the artistry or to capture your passion, in daylight or at dusk, the AF-S NIKKOR 24mm f/1.8G ED will widen your creative capabilities. Unleash the full potential of your high-resolution Nikon DSLR. 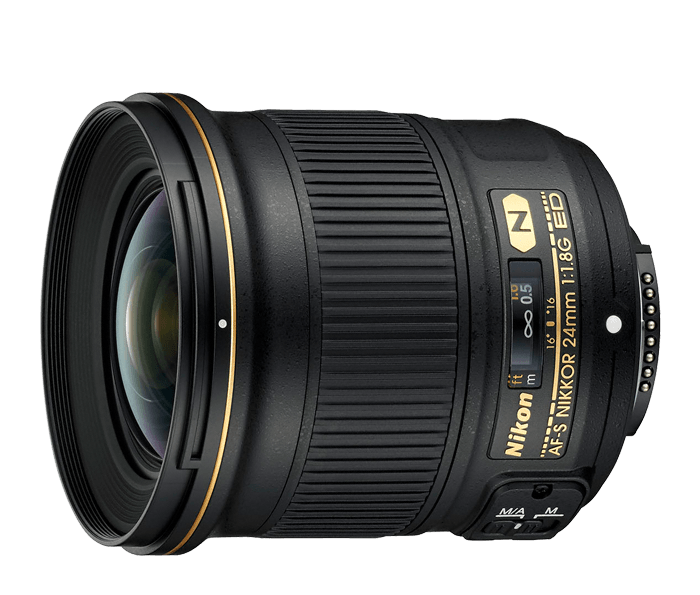 The AF-S NIKKOR 24mm f/1.8G ED's combination of Nano Crystal Coat (N), Extra-low Dispersion (ED) glass and Aspherical (AS) lens elements produces extreme sharpness with virtually no ghosting, flare or distortion—even at the far edges of the frame. Marvel at every photo and video. The combination of wide-angle perspective and a fast f/1.8 aperture opens exciting new shooting possibilities. Make your subject pop against a softly blurred background or foreground. Exaggerate depth-of-field simply by getting closer to your subject. Capture dramatic low-light sunsets or skyscrapers—even star trail photos—with outstanding image quality. Expand your horizons. Harness the same image quality, low-light capabilities and beautifully blurred backgrounds of the AF-S NIKKOR 24mm f/1.8G ED at other versatile focal lengths: 20mm for dramatic perspective and maximum depth-of-field, 28mm for travel and landscapes, 35mm for classic documentary views, 50mm for a natural perspective or 85mm for portraits. Only Nikon offers such a broad system of fast f/1.8 full-frame prime lenses. A lens with a curved, non-spherical surface. Used to reduce aberrations and enable a more compact lens size. Aspherical lenses minimize coma and other types of lens aberrations, even when used at the widest aperture. They are particularly useful in correcting distortion in wide-angle lenses and help contribute to a lighter, more compact design by reducing the number of standard (spherical) elements necessary. Aspherical lens elements correct these distortions by continuously changing the refractive index from the centre of the lens.